Thanks everyone for being part of our World Refugee Day Benefit for the International Rescue Committee! Thanks to all the Big Blue Door volunteers, musicians, crew, cast, and audience members who bravely stepped up to read segments of interviews by Big Blue Door Jammers Elizabeth Derby, Yousaf Sajid, Maggie Thornton, Andrea Rowland, and IRC volunteer Stephanie Lind! More about where the interview subjects came from here. Thanks to IRC Volunteer-Donations Coordinator Katie Bercegeay for the non-trivial Trivia contest! Thanks for the wonderful songs by Ben-David Warner & Joe Basconi, and for learning ‘Keep Your Eyes on the Prize‘ just for our show! Thanks for cool longform improv by Nauder Namaky, Brian Weisbrod, Stacey McCormick, Larry Goldstein, Nik Hayes or Big Blue Door’s house team, the Lady Pills. Come check them out Sunday night at 8pm just down the road from Cville Coffee at the Director’s Studio. Thanks to Cristan Keighley and Karen Shaffer for stepping in last minute to help us on sound and at the door! 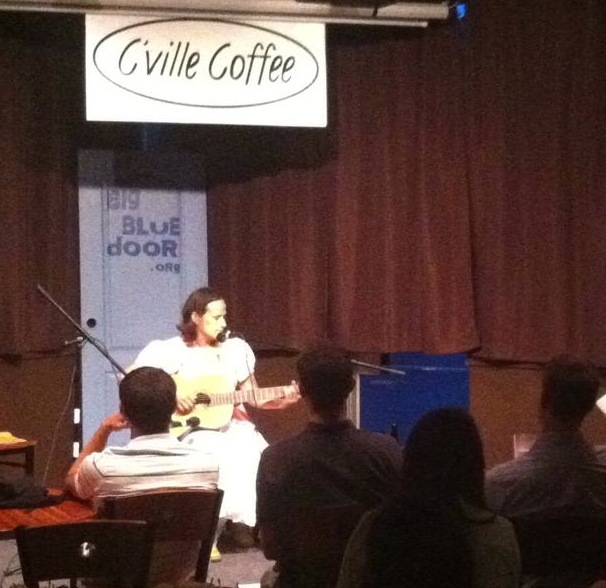 Thanks to Toan and Cville Coffee for giving us a place to put on our shindig! Finally, thanks to the International Rescue Committee for making the world a better place! Pictures of the show coming soon!